Dry eye is a very common complaint affecting literally millions of people. It can be a stubborn and complex problem which is influenced by many factors. Dry eye is a multifactorial disease of the tears & ocular surface that results in symptoms of discomfort, visual disturbance & tears instability with potential damage to the ocular surface. There are numerous products and treatment regimens available which can offer significant relief to dry eye sufferers and help repair damage caused by dry eye. Treatment is aimed at both the symptoms and the cause. So how is dry eye diagnosed? The treatment of dry eye will depend on the cause and the symptoms and we aim to deal with both. Treatment of eye eye usually involves the use of eye drops known as artificial tears or ocular lubricants. There are lots of different products available. Some are thin and watery, some are more viscous and some are thick and gel-like. Thin, watery preparations are usually used to begin with in mild dry eye. The thicker, more viscous formulas are often more effective but have the disadvantage of potentially blurring the vision (transient effect). Gels and ointments are used mainly at night. Ideally, any product used should be preservative-free and dry eye sufferers should avoid products that make the eyes “sparkle”. It is important to remember that different products do different things. Some are best for aqueous deficiency, some for mucous deficiency, some for lipid deficiency and some are recommended for contact lens wearers. Meibomian gland dysfunction (MGD) is a chronic abnormality of the meibomian glands. These small glands are found along the margins of the eyelids. MGD may result in alteration of the tear film, give symptoms of eye irritation and result in clinically apparent inflammation and ocular surface damage. MGD gives rise to classic dry eye symptoms which are often worse on awakening. These symptoms are caused by the overnight inflammatory affects of the eyelid margins. Patients often say that it takes their eyes a while to get going in the morning! Blurry vision is another common symptom which is caused by debris in the tear film. 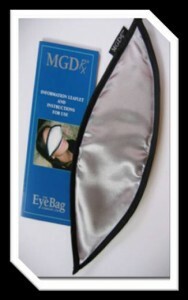 The management of MGD is an ongoing process that consists of eyelid hygiene (heat followed by massaging of the eyelids), eyelid cleansing and ocular lubricants. In very severe cases oral antibiotics are required. Heat is best applied to the eyelids by means of an MGDRx EyeBag which is heated in a microwave for 30 seconds and applied to the eyelids for 10-12 minutes. The Blephasol range of eyelid cleansing products is recommended for eyelid cleaning following heat treatment. These effectively remove crusts and secretions, do not irritate skin or eyes and have a pH which is similar to the skin and are preservative, alcohol and fragrance free. Don’t be temped to use baby shampoo. This may be good for washing your hair but it can make the symptoms associated with dry eye and MGD worse! If you think you are suffering from dry eye or MGD contact us to arrange a dry eye assessment.